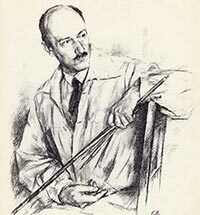 EUGENE (YEVGENY) LANCERAY IS ONE OF THE FEW RUSSIAN ARTISTS WHO NOT ONLY EXPERIENCED BUT ALSO CAPTURED IN HIS WORK MANY EVENTS OF BOTH THE FIRST AND SECOND WORLD WARS. 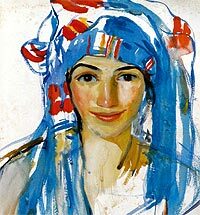 IN THE WINTER OF 1914-1915 HE TRAVELLED TO THE TURKISH FRONT TO PAINT LOCAL PEOPLE, COSSACKS AND EVENTS ON THE BATTLEFIELD. THAT WAR WAS CALLED THE T,REAT PATRIOTIC WAR", AND IT WAS FOLLOWED BY THE BOLSHEVIK REVOLUTION IN 1917 AND THE CIVIL WAR. BUT FEW COULD HAVE FORESEEN THAT A NEW WORLD WAR WOULD BREAK OUT SO SOON. ON SEPTEMBER 4 1939 THE ARTIST WROTE IN HIS DIARY: "A SECOND WORLD WAR! AGAIN EVERYTHING IS FALLING APART! BUT INERTIA STILL RULES WHILE BOTH I AND EVERYBODY ELSE TALKS AND CARES ABOUT THE SUBTLETIES OF PROPORTIONS AND SHADES OF COLOURS!.. I'M THINKING ABOUT THE PARISIANS AND KOLYA." ON SEPTEMBER 9: "OLYOK IS FEELING LOW BECAUSE WAR IS LOOMING. PEOPLE SEEM TO BE BUYING UP FOOD. QUEUES EVERYWHERE. HUGE CROWDS IN THE SAVINGS BANKS." ON SEPTEMBER 24: "HISTORICAL EVENTS ARE FOLLOWING EACH OTHER IN A FLASH: THE 17TH - SOVIET TROOPS ENTER POLAND. POLAND'S ULTIMATE DEBACLE, AND YESTERDAY - ITS PARTITION; EVERYONE IS SPECULATING WHO WILL GET HOLD OF WARSAW, WHICH STRADDLES THE DIVIDE." BUT THE WAR WOULD ONLY REACH RUSSIA IN JUNE 1941. So that's how you are, the East!